These Peanut Butter Dog Treats are for...well...Dogs! Each week we do a fun cooking project. 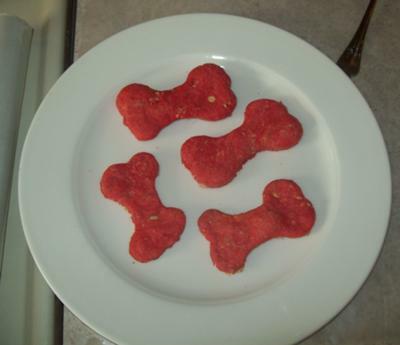 And this week we tried dog biscuits for our dog. They were fun to make and a big hit with our dog! He even tried to steal some while they were cooling. We cut them out with dog bone shaped cookie cutters that we got in a huge pack of random cookie cutters at a baking store. We dyed them with red food coloring for fun. Preheat oven 400 degrees F. Mix all ingredients in the order listed. If you want to dye them with food coloring do this now. Shape into a ball. And then roll out. Either cut out with cookie cutters or use a pizza cutter and cut into small rectangles. Bake for 25 minutes or until crisp and hard. Let cool before giving one to your family pet. Comments for Peanut Butter Dog Treats! !